Drought is one of the predominant abiotic stresses which have phenomenal impact on crop productivity. Alterations in aquaporin gene expressions are part of complex molecular responses by plant in response to drought. To better understand the role of aquaporins in economically important crop chilli (Capsicum annuum), drought induced gene expression of twelve aquaporins was determined in drought tolerant—KCa-4884 and drought susceptible—G-4 genotypes. Conjointly, the effect of drought on leaf water status and photosynthetic parameters were evaluated. Gene expression of all examined 12 aquaporins was up-regulated in KCa-4884 and in contrast, all the aquaporin genes were down-regulated in G-4 under drought stress. Significant variations among two chilli genotypes have been recorded in photosynthetic rate (Pn), stomatal conductance (Gs), and relative water content (RWC), sub-stomatal CO2 concentration (Ci). KCa-4884 revealed significantly high rates of Pn and RWC and decreased Gs under water deficit conditions providing evidence for superior drought adaptive strategies. Differences in physiological parameters illustrate prevention of water loss during drought. 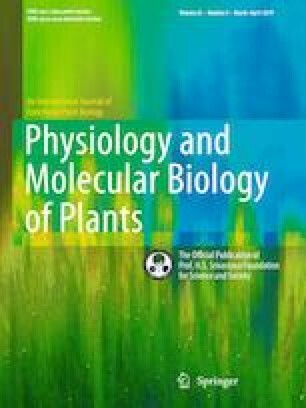 Up-regulation of aquaporins in drought tolerant genotype implicates their possible role in water relations and photosynthetic performance even under extended drought conditions. The online version of this article ( https://doi.org/10.1007/s12298-019-00655-7) contains supplementary material, which is available to authorized users. Authors gratefully acknowledge University Grants Commission (UGC), Government of India (F.No: 30-10/2015/SA II), for providing financial assistance. Authors also sincerely acknowledge DST- FIST, Government of India (File No: SR/FST/LSI-608/2014 (C.)) for providing instrumentation facility.